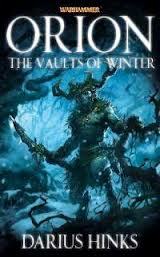 Each spring, Orion, forest-king of the Athel Loren wood elves, is reborn to rule and protect his kingdom. This year, something is wrong, he has been cursed, something is rotten in his core. If that wasn’t enough, outsiders, in the form of bull-headed chaos beings, have invaded the realm and seem to have inside help. Some of the defenders mobilise to face the threat, mainly the elite shadow-dancers, but the main army is left idle because the rulers don’t believe the wood is in any danger. Meanwhile, the distracted Orion stomps around the woodland in search of answers from a variety of beings, good, bad and neutral. I know what you’re thinking, â€œdamn, wood elves again!â€ but this time we have something different. These elves aren’t your noble, high and mighty Tolkienesque beauties, with fresh pixie dust in their underwear. No, these are snobby, arrogant and deluded individuals, divided by class and status. And the wood itself is a living thing, filled with spirits who have their own agenda. Overall, this is mythic fiction as it should be, a high-magic, high adventure, with flawed, believable characters, a good story line and a decent, fast pace. I will certainly look forward to reading book two when it comes along.